The hilly stage to Mende with the hard climb up the Côte de la Croix Neuve prior to the finish was a perfect set up for a breakaway to succeed—which is exactly what happened. The start of the stage saw the peloton split into four big groups in the opening kilometers, which caused some major alarm bells among the riders: the fast start gave an advantage to attentive riders hoping to make the break. In the end it was 31 riders who broke clear—and decisively so. They gained over 9 minutes on the peloton at one point. The jockeying for the stage win splintered this group on the hard climbs preceding the finish. In the end, it was Spanish rider Omar Fraile who was to master the final climb and take a massive victory. The South African rider Daryl Impey is known for his aggressive riding and his ability to win on the exact terrain seen in this stage, which consisted of one C4 climb, a C3 climb and two C2 climbs. It was no surprise to see him on the attack from the start, mixing it up with the leaders as the peloton sped into the crosswinds in the opening kilometres of the stage. The strong winds battered riders’ right shoulders, and it is in this blustery part of the race that Daryl did his peak 20min power. He averaged 364w, 5.10w/kg with a normalized power of 390w, 5.45w/kg to keep his place in the front echelon and forge the gap open. We can see that the effort was not very consistent, with seven or so bursts over 600w. It was also within this opening 16km that he did his peak 1min power for the day, an effort of 514w, 7.20w/kg. He hit a max of 1120w, 15.67w/kg during this big punch. The effort settled down as the gap was made and calmness was restored to the peloton. In the 60km before the first climbs of the day, Daryl did 267w, 3.74w/kg, showing that the large group worked well together. But the cohesion was not to continue after the first real test on the long climb of Col de la Croix de Berthel (9.1km at 5.3 per cent). The first big climb of the day was the C2 Col de la Croix Berthel, which several riders took advantage of to reduce the number within the leading group. Spanish climber Gorka Izagirre (Bahrain-Merida) kicked off the attacking festivities 59km out, taking with him Jasper Stuyven of Trek-Segafredo and Tom-Jelte Slagter (Dimension Data). This was a compelling move, but Daryl kept his composure and maintained a steady effort, betting that with nearly 60km of racing to go, the three had attacked too early. Col de la Croix de Berthel (9.1km at 5.3 per cent). The alarm bells started to sound in the uncategorized ‘lump’ between the climb of Col du Pont san Eau and the valley road leading riders into the final climb. It was at this point (with 37km to go) that Daryl’s chase group started to fragment. When De Gendt and Calmejane went on the offensive, they split chase group for good. It was on this very hilly terrain that Daryl produced his peak 2min and 5min powers of the day trying to keep within reach of the riders attacking off the front. 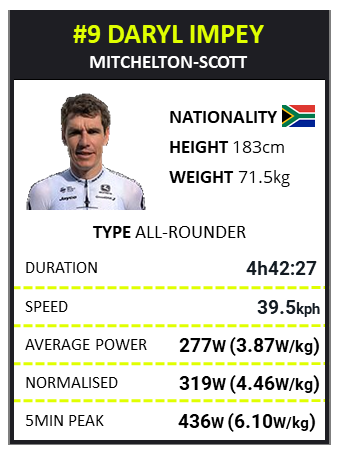 His peak 5min power was 436w, 6.11w/kg, enough to maintain his place within the leading group. As the riders approached the final climb of the day, the very steep The Côte de la Croix Neuve (3km at 10.2%), Jasper Stuyven (Trek-Segafredo) was leading solo with 1:40sec over the others. Daryl’s chasing group was down to 11 riders. 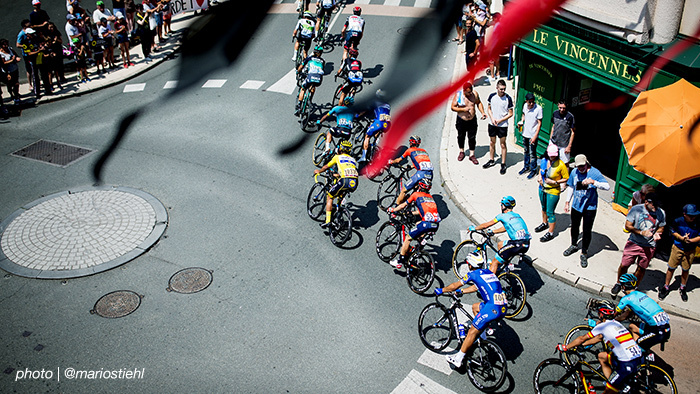 This climb proved pivotal as riders tried to forge a gap over the top, a strategy which proved successful for eventual winner Omar Fraile (Spa) Astana Pro Team. It was on this climb that Daryl set his peak powers for 6, 10, and 12min, which is no surprise given the grade of the climb and pace of the group, but note that he had a very evenly-paced effort. We saw many other riders digging deep on the climb and then blowing up, but Daryl knows from experience that going too far over your limit on a climb this steep can make recovery almost impossible. His measured effort throughout the climb shows only one big spike—going up to 700w+ as he accelerated over the crest of the hill. This final effort propelled Daryl into the top ten riders, but with only a short 1.5km stretch to the finish, the pressure was still on. We can see that his effort did not let up as in the final 350m, where he averaged 590w, 8.26w/kg. This is what it looks like when a Tour de France rider empties the tank after a really hard 4 ½ hrs of racing. His TSS score on the day (315) is one of the highest we have seen so far of the TDF, and worth it for a top ten finish. Congratulations on a fantastic ride by the ever-aggressive Daryl Impey!